Ergomotion's 7Flex Monitor Arm and 7500 Wing Monitor Arm (pictured) come with a special hardware called "FLEXmount", which means they're fitted with six mounting options suited to almost any setting. A monitor arm is a device that attaches to your computer screen and is easily adjustable, which means it requires minimum effort but can achieve maximum precision. 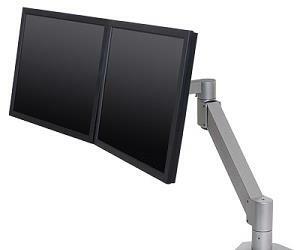 A monitor arm gives you full control of your monitor's positioning, such as height, depth, and angle. It also makes better use of your desk space: a suspended screen means more room and less clutter. We all have different preferences and requirements, so having the freedom to adjust monitors to our exact liking means more comfort, less strain on the neck, shoulders and wrists, and a more productive work environment. 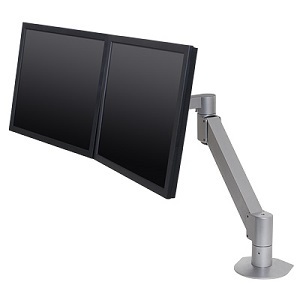 Additionally, monitor arms are ideal for workstations which are shared between more than one user due to factors like long opening hours and multiple shifts. Ergonomic office furniture means users can tailor their workstation to accurately suit them. It's also great for those who wear bifocal and multifocal lenses. Standard monitor heights probably won't be suitable and may result in poor neck posture. The optimum position of a monitor for someone who wears multifocal lenses is a balance between being able to easily see the screen through the correct lenses as well as minimising neck bends. Will you normally be using one or two monitors? Wing monitor arms are excellent for holding two monitors side-by-side (horizontally) or one over the other (vertically). What kind of adjustments do you want? Height, depth and angle are the three key ones. Ergomotion's range addresses all three of these adjustment types. How do you want your monitor arm mounted? Do you want it clamped to the desk? Attached to the wall? Or are you unsure? Ergomotion is a specialist is the design, manufacture and supply of ergonomic office equipment, and have a range of monitor arms. Two models they supply, the 7Flex Monitor Arm and 7500 Wing Monitor Arm, come with a special hardware called "FLEXmount", which means they're fitted with six mounting options suited to almost any setting. This is great if you're not sure which kind of mount to select. You've got half a dozen options to choose from now. What are some tips for optimum monitor positioning? A good distance for your monitor arm is normally at about arm's length — as far away as possible but where you can still read comfortably and are not straining your eyes to see your screen. The top of your screen should be just below your eye line. You should be able to read the bottom of the screen without feeling your head bow down. Adjust the screen position to eliminate factors like glare and reflections from lights or windows. Of course, these guidelines will not suit everyone, so it does take a bit of trial and error to determine the best positioning of your monitor.